The last thing you want to do during a heat wave is turn on the oven. This no-bake almond butter and yogurt cheesecake from Mangoes and Palm Trees will help cool you down without warming up your house in the process. 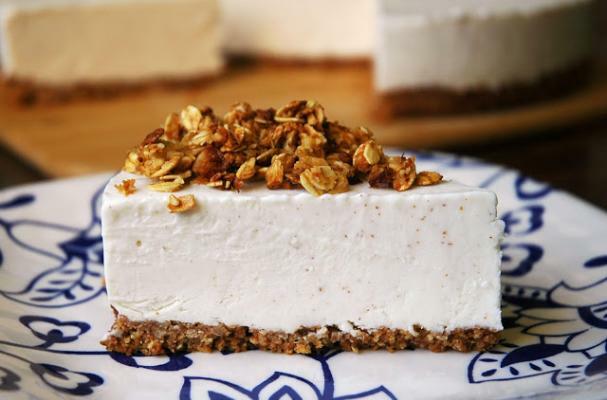 The unique cheesecake crust is a mixture of graham crackers and coconut granola. The result is a crust with a nutty, caramelized flavor. The rich and creamy filling combines cream cheese, whipping cream, Greek yogurt and almond butter. Instead of baking the cheesecake or adding gelatin, this dessert is put in the freezer to set overnight. For full recipe instructions, click here.